So, any possibility to get this format for printing on personal paper? Katrin, Send me your email address (ray DOT blake AT gmail DOT com) and I'll send you what you need. 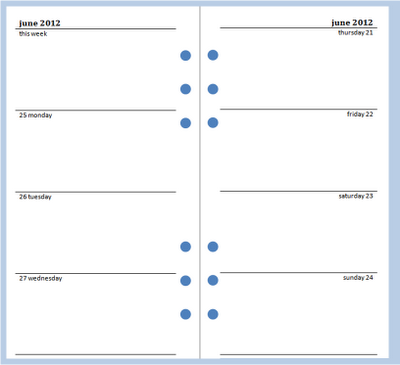 Hi, i have been looking around all of your diary pages and like this layout the best...is there a set that is the same but lined??? No, there isn't. I can add it to the development list if you like. 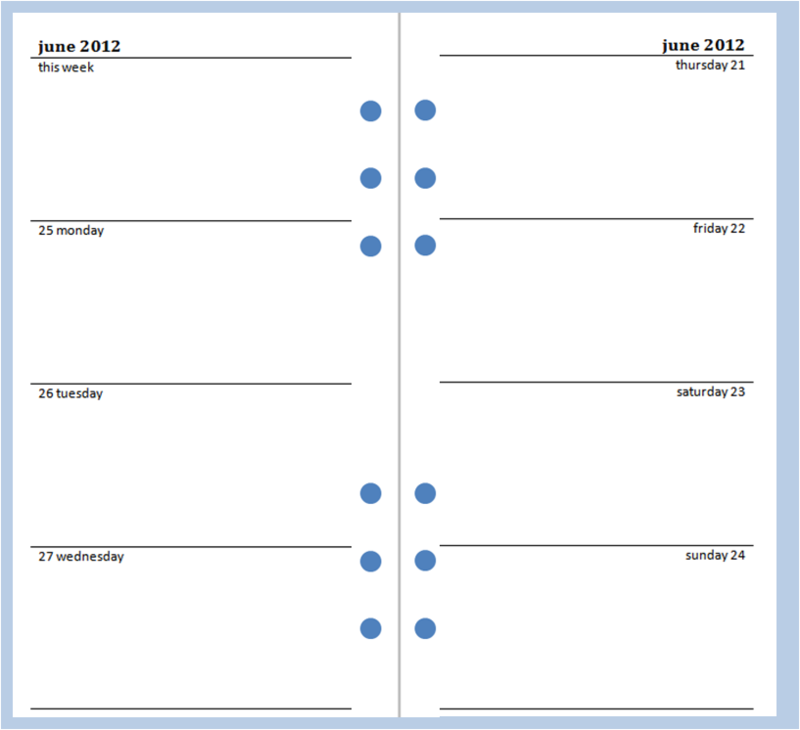 I have attempted to print these diary pages on regular size paper and I can't seem to figure out the crop marks where do I cut? I tried sizing it to the expense sheets I have but it does not seem to be working. What do you mean by 'regular size paper'? Mr. Blake, I am printing the diary pages on 8.5" x 11" paper. I printed the odd pages and then the even pages first; however, when I printed the even pages they printed towards the left which prevents me from having an accurate double sided diary sheet when I cut it. Basically, the front page is perfect but on the back some of the words are cut out on the left hand side. Ah, this is the problem. The templates are set up as A4 documents and not Letter size ones. If you want to use them you'll need to get some A4 paper, which is available from Amazon. Thank you for all of these free printable inserts!! I was wondering if there was any way we could get a WO2P for letterhead paper, that would be amazing! I'm working on WO2P sets for Letter paper now and should have them up early next week.